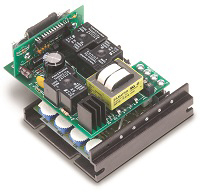 DC Motor Drive - SCR The 130 Series reversing control from Dart Controls utilizes Dart’s unique zero-speed detect and solid state dynamic braking circuits. These circuits eliminate the contact arcing and failed braking problems associated with other reversing and dynamic braking controls. Dart’s zero-speed detect circuit also eliminates motor plug reversing problems. In the event of a power loss or emergency stop condition, the 130 Series control will drop into a dynamic brake condition to safely and quickly bring the motor to a stop and remain there until power is reapplied and a run condition is recognized. The 130 Series control comes in a compact package and fits the industry standard footprint for both vertical and horizontal mounting.